All manner of frogs and toads can be found in the tropical forests of the Southeast Asian nation of Myanmar. The Himilayan newt can be found in Malaysia. Myanmar is also known as the Republic of the Union of Myanmar and Burma and borders Thailand, China, Laos, India, and Bangladesh. It is a country with vast forest and dense tropical growth that covers 49% of the country. Yangon is the largest city in Myanmar and has numerous parks and lakes that are home to the country's native amphibians. All manner of frogs and toads can be found in the tropical forests of the South East Asian nation of Myanmar. The Two-Striped grass frog is mostly found in Asian countries like Myanmar, Vietnam, Cambodia, Hong Kong, India, Taiwan, Laos, Thailand, Bangladesh, and China. The Two-Striped grass frog is a small amphibian that may grow to a snout-vent length of 4cm. The male Two-Striped grass frogs are a little smaller than the female frogs. There have been reports of the existence of the Two-Striped grass frog in Bhutan. The Blyth's river frog is a large with smooth skin around the dorsal and can either have or not have longitudinal skin folds or dispersed tubercles. The Blyth river frog could be brown, yellow or gray on top and white or yellow underneath. The frogs mostly live in streams that have rocks and gravel in evergreen forests. The male frogs build a nesting hollow in a sandy stream, and their tadpoles grow in rivers. The major threat to the Blyth's river frog is that they are collected for both trade and local consumption. The painted chorus frog is found in Myanmar. Its natural habitat includes the tropical and subtropical regions of moist shrub land, moist montane forests, moist lowland forests and swamps, marshes, ponds among others. The frogs have a smooth skin with small smooth warts on top. The painted chorus frog has brown on their back, red on the limbs and sides. The Chinese flying frog is also known as the Chinese gliding frog. The frog's natural habitat includes the tropical and subtropical regions of moist montane forests, rivers, swamps, marshes among other wet marshy habitats. The female Chinese flying frogs lay their eggs in foam nests that are attached to nearby grass and branches to the water. These species of frogs have no particular threats. 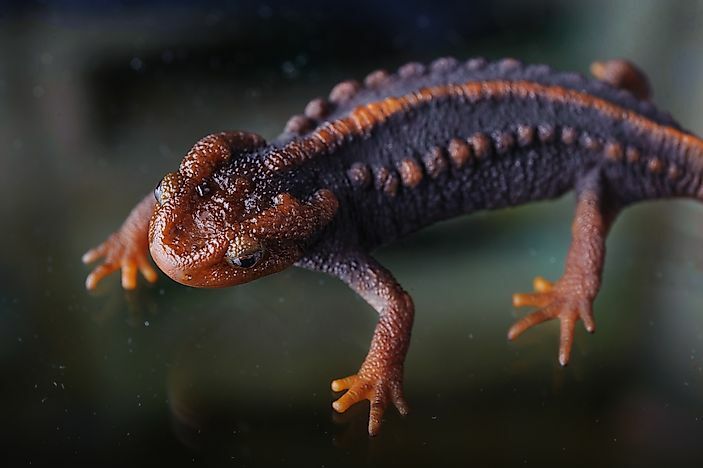 The Himalayan newt has five toes and a wide tail that enables it to swim very well. The frog has a wide head and a snout with no lobes on its lips. The Himalayan Newt is blackish brown in color and a bit pale on other parts of its body including the chin, lips, snout, throat, and below the limbs. Himalayan newts feed on worms, scorpions, millipedes, mollusks, spiders and other insects. There are other numerous amphibians in Myanmar with ten of them being native amphibians. These amphibians do not only bring out the biodiversity of Myanmar but also show some of the most exquisite salamander only found in few regions.